“If any want to become my followers, let them deny themselves and take up their cross and follow me.” John Hus understood this call to discipleship as well as anyone ever has. The spiritual founder of the Moravian Church knew what it meant to deny himself, to take up his cross and follow Jesus. John Hus was born in Czechoslovakia towards the end of the Middle Ages. By the standards of the day, Hus had it all. He was well educated, well respected, and well loved. And he gave it all up to follow Jesus. Hus was rector (highest academic official) of the University of Prague. He was an ordained priest in the Catholic Church. He was a champion of the people in Czechoslovakia. And he gave it all up to follow Jesus. Hus’ discipleship caused him to risk and lose all that he had, even his very life. On July 6, 1415, he was burned at the stake as a heretic. He lost his life because he had denied himself, taken up his cross, and followed Jesus. All that he had achieved, all that he had worked for, all that he had earned, he sacrificed to follow Jesus. When Hus was burned at the stake, he had no way of knowing that his ideas would live on. He did not know that his words and teachings would so inspire people that, over 600 years later, he would still be known and celebrated. He simply did what Jesus said: he denied himself, took up his cross, and followed Jesus. We hear the phrase a lot, “That’s the cross that I have to bear.” but we don’t really understand it. Actually we think that we understand it. We think that bearing our cross is having to do something that we would rather not do, or having to go places we would rather not go, or having to deal with people who we really don’t like. For us, “bearing our cross” is something that is unpleasant but we do it anyway. We do it “for Jesus.” But when we use it like that, we trivialize what it really means to bear a cross, what it meant for Jesus and what it means for us. Denying ourselves, taking up our cross and following Jesus is much more than simply being momentarily uncomfortable and then going back to our privileged lives. Denying ourselves, taking up our cross and following Jesus is a call for us to give it all up, to give up everything we have and everything we are, everything we think that we have “earned”, everything we believe that are entitled to, even everything that we see as God’s blessings in our lives. Because none of those things belong to us. This world doesn’t belong to us. This church doesn’t belong to us. Our lives don’t belong to us. 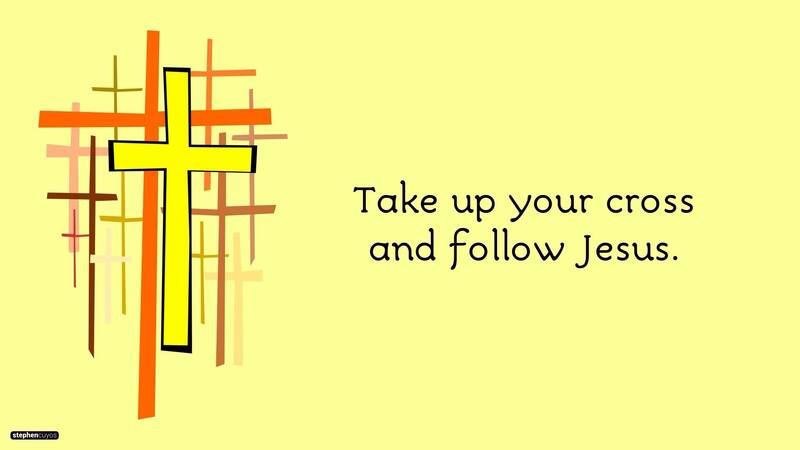 When we think that our life does belong to us that is when we need to deny ourselves, to take up our cross, and follow Jesus. Think about what Jesus gave up. There he was the only Son of God, eternally begotten of the Father, God from God, Light from Light, true God from true God, begotten, not made, of one Being with the Father. Through him all things were made. This was who he was and what he was doing until… For us and for our salvation, he came down from heaven was incarnate of the Holy Spirit and the Virgin Mary, and became truly human For our sake he was crucified under Pontius Pilate; he suffered death and was buried. Jesus gave up everything he was and everything he had. This is what it truly means to deny yourself, to take up your cross and follow him. And this is what we so greatly fail to do. Instead we take what we have and we hold it tightly. We hold on to it for dear life, afraid that if we let go, we will lose it all, and everything will change. Jesus is calling us to do just that. Jesus is calling us to let go of what we hold most dear, to let go of ourselves, to let go of everything that we have worked so hard to obtain. Jesus is calling us to let go of all those things that we think we have to have and that we work so hard to maintain, all of those things that we think are important. Jesus is calling us to let go of it all and deny ourselves, to let go of our very lives, to take up our cross and follow him. As we gather for worship on this day, as we remember John Hus and how he answered Jesus’ call, as we hear Jesus calling us to do the same, we admit that it is frightening. We know that it is scary, we know that it is hard, we know that it may lead us in places we don’t want to go and require us to do things that we don’t think we can do. Yet we know that it is what we must do, if we truly want to be followers of Jesus.